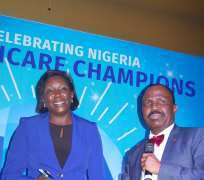 Total Health Trust (THT) Limited, a leading Health Maintenance Organization (HMO) has emerged winner of the Health Maintenance Organization of The Year Award at the 2016 Nigeria Health Care Excellence Awards held at Eko Hotel in Lagos on Friday 24th June 2016. The Health Care Excellence Awards, which has four main categories and 31 sub-categories, saw the organization winning the award in the Health Maintenance Organization category, ahead of fellow industry players; Hygeia HMO, Redcare HMO and Avon Healthcare who were also nominated. Speaking while receiving the award on behalf of the company's CEO, THT General Manager, Stakeholder Management and Business Development, Dr. Adeola Majiyagbe said "This award is dedicated to every THT enrollee who has entrusted us with providing them access to quality healthcare. We are committed to providing outstanding leadership by delivering value to all our partners through continuous innovation in product design and service delivery" The annual Nigeria Healthcare Excellence Awards are an initiative of Global Health Project and Resources (GHPR) in partnership with Anadach Group USA, and are designed to celebrate and recognize the best individuals and organizations that have contributed in a remarkable manner to the improvement of the Nigerian healthcare sector. The awards also recognize the rapid growth of the healthcare sector, and the capacity of individuals to influence and set new performance standards in Nigeria and beyond. More so, the awards focus on among other things, elevated performance; the creation of new business models as well as recognizing and embracing new trends. Total Health Trust is one of Nigeria's pioneers in its industry, renowned by its stakeholders for integrity, service innovation and reliability. The company has been connecting its members to healthcare providers since 1998. It has an unrivalled 18 year industry track record, has built a formidable reputation in Nigeria and remained the HMO of choice for over 300 000 enrollees from local and multinational corporate clients and government institutions.